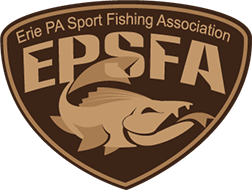 The EPSFA was formed to educate, enhance and protect the sport fishing in Pennsylvania, especially in Lake Erie, Presque Isle Bay and its tributaries. To that end, we have established goals which we believe will define our organization’s activities by their significant diversity. We welcome and invite you! To create an open forum for the individual to discuss their views and fishing interests. To protect fish stocks, create environmental awareness and conserve resources related to Lake Erie, Presque Isle Bay and their tributaries. To create educational and competitive fishing opportunities in the Erie area for both the amateur and professional fisher-persons. To maintain a public voice with Local, State, Federal and International legislative agencies. To collaborate with local fishing clubs and associations throughout Lake Erie. To be an advocate of a bona-fide Lake Erie brown trout stocking program.